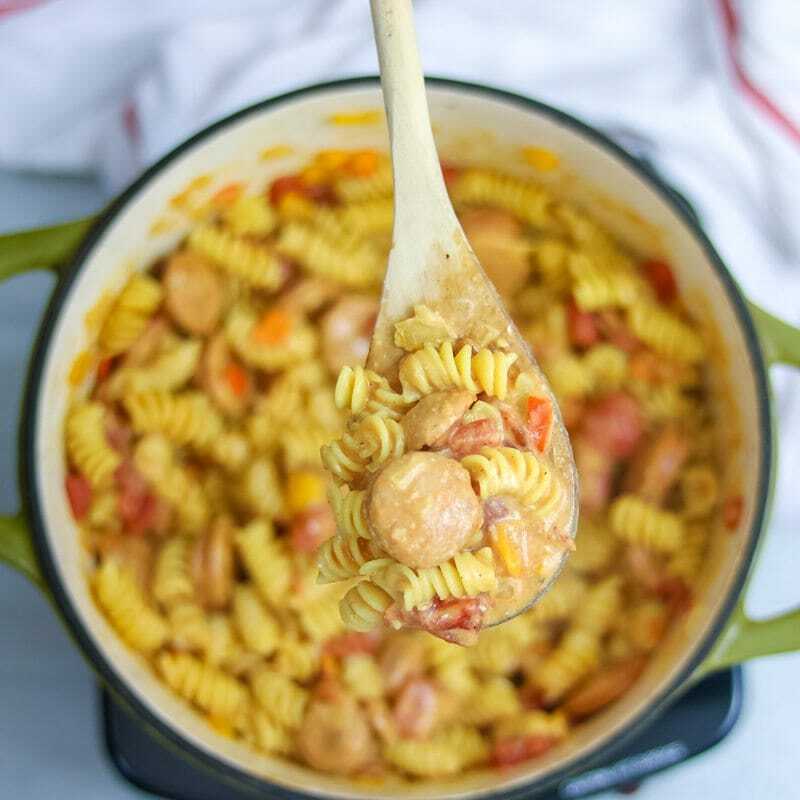 Easy One Pot Creamy Cajun Pasta: It is easy as dump and simmer and in less than 30 minutes a hearty Cajun pasta with a creamy, slightly spicy sauce will be on the table ready to win your family’s taste buds over! Thank you to al fresco all natural chicken sausage for partnering with me to help bring you this recipe. As always, my opinions and recipe remain my own. Dinner. Day in and day out dinner has to be made. And 9 times out of 10 it is me that makes it. Wait, it is more like 364 out of 365 times it is me that makes dinner–LOL! And while I love to cook, 30 Minute Meal Recipes are my weeknight go-tos. When I can make a one pot meal, like Skillet Chicken Poppyseed or Tuscan Pork Skillet, I am one really happy person. Because that is one less dish I have to do–you guessed it, I typically do the dishes as well. My secret to easy, weeknight meals is taking ingredients that are jam-packed full of flavor and using those key ingredients to bring huge flavor to a quick recipes, and that is exactly what I did for this Easy Cajun Pasta Recipe. Take this Cajun Chicken Pasta. I start with al fresco all natural Smoked Andouille which is packed with Spanish paprika, black pepper and garlic and is so good, it can stand alone. Added to pasta, this chicken Andouille lends tons of flavor and just the right kick to dinner. Even though this Cajun Pasta veers off classic comfort food dishes like Creamy Cheesy Chicken and Rice and Chicken Pot Pie, this pasta dish has become a new comfort food, family favorite in my house. 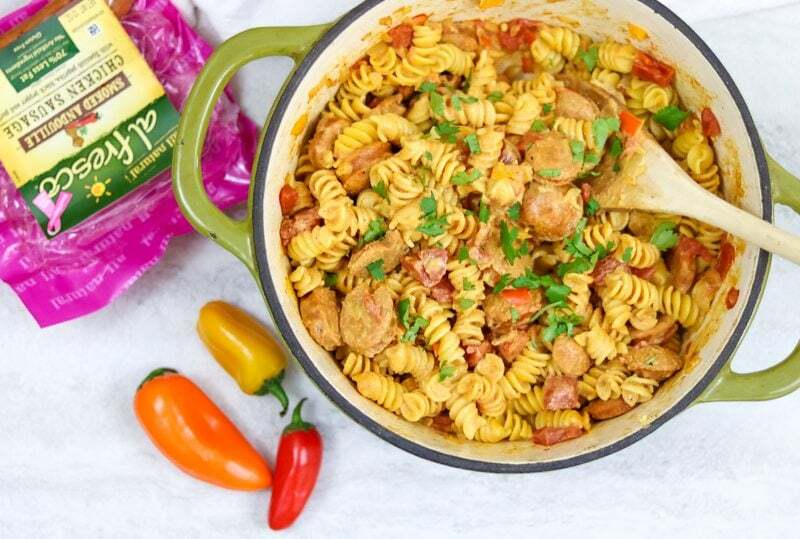 The combination of perfectly tender pasta that has been enveloped in a spicy, creamy Cajun sauce paired with the bite of delicious al fresco all natural chicken sausage is pure magic. And really, what is better than dumping a few ingredients into a pot and less than 30 minutes later, you are sitting down to a wholesome family meal? Not much in my book! Sauteing the onions and peppers in olive oil is a quick way to impart a lot of flavor into this cajun pasta dish, but if you want to speed up the process of this dish, just omit this step. You can add the peppers and onions directly to dish when you add the broth, or you can omit them all together–which if you have kids who want to pick around onions, you may just want to leave them out! I use chicken stock in this dish, but vegetable stock or beef stock work as well. I use rotini noodles for this Cajun pasta, but elbow noodles will or cavatelli works as well. The cream cheese that is added to this dish, cuts the spice level down and gives the dish a luxurious mouth feel and taste. You can also stir in 1/4 cup plain Greek yogurt in place of cream cheese to cut down on fat and calories. If you have a dairy allergy, omit the cream cheese to make this Dairy Free Cajun Pasta. If you want to make Gluten-Free Cajun Pasta, use Barilla Gluten Free Elbow Noodles. 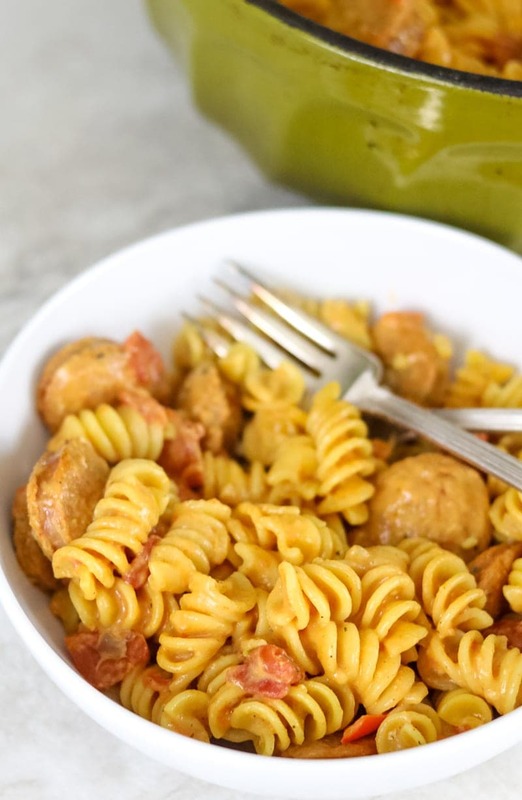 An easy, one pot cajun pasta comes together in less than 30 minutes with spicy chicken sausage, rotini noodles and a creamy sauce. Over medium-high heat, saute peppers and onions in olive oil until soft, about 3-5 minutes. Add in sausage and garlic and saute 1-2 minutes. Add in stock, tomatoes, and seasoning and bring to a boil. Add in pasta, reduce heat to simmer and cover with a lid. Cook for 10 minutes. Remove lid and add in cream cheese and stir into pasta. Cook until cream cheese has melted and pasta has finished cooking, about 5 minutes. This looks yummy! The perfect meal to easily get on the table during our hectic week. Love it!! Yum! Adding to my one pot dinners list! Can’t wait to try it! YAY!!! I hope you enjoy! One pot meals are perfect this time of year, and this looks perfect! 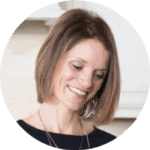 Thanks Dee–one pot meals are always welcome at my house! Love using sausage this way and one pot meals are the best!! One pot meals are simply the best! I bet this is super flavorful! It looks and sounds amazing, and I love how easy it is to put together (hellooooo busy life)! I love al fresco products, too! 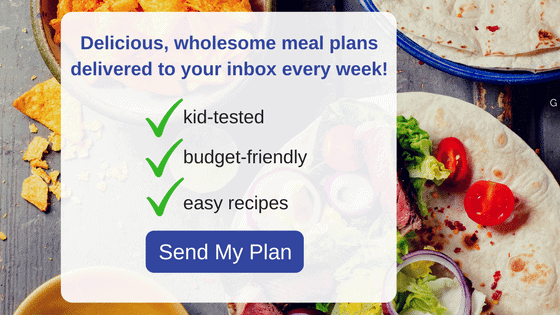 Hello busy life is right–this recipe is a life saver! I got your free ebook of 7 Spice Blends. The recipe blend for Cajon Seasoning is actually a duplicate of Onion Soup Mix. I love cajun flavors! I have got to try this! I hope you do Amy! If you love cajun, you will love this! Oh I’m all about the one pot easiness! All the words I love in a dish! Easy, Creamy, and Cajun! Who dosen’t love all those things?! Hope you give a try! Love an easy dinner like this! Perfect on a busy weeknight! Swoon. It’s hard to believe how simple this is- it looks almost too good to be true! Definitely need to try! 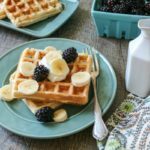 It is NOT too good to be true Karly–this is so easy and so flavorful. Enjoy! The pasta looks super delicious! Easy during the Holiday Season is a MUST! Wow Kristen, this looks like a wonderful easy dinner. I love one pot meals! Thank so much Amanda! Nothing makes me happier than to hear your family enjoyed this!